Power core aeration is one of the most important cultural practices available for your lawn. Annual or semiannual aeration is advised for all lawns on heavy clay soils, those with a thatch buildup, and any lawn that needs to be "thickened up." Gravity, foot traffic, lawn mowers, and rainfall cause soil to become compacted over time. 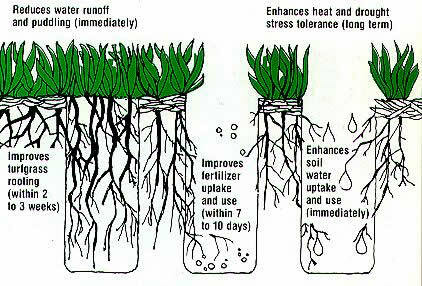 Aeration also helps control thatch, improves the soil structure, helps create growth pockets for new roots, and opens the way for water and fertil­izer to reach the root zone of your lawn. 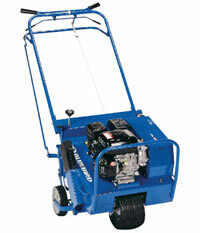 Aeration removes small cores of soil 1" to 3" in length from your lawn. These cores break apart fairly quickly after watering and mowing. Aerating relieves pressure from compacted soils, letting oxygen, water and nutrients move more freely throughout the root zone. Performed annually, aeration significantly reduces thatch build-up and improves turf growth. Bermuda grass, both common and hybrid, needs to be actively growing before we perform aeration. Optimally this is from May to July of every year. How does Dethatching a Lawn Work? A lawn dethatcher can also be called a power-rake, a thatching machine or a lawn sweeper. Try not to get to confused because all of these different titles mean the same thing. They all refer to a machine that acts like a vertical lawn mower. The blades spin very quickly on the surface of the grass removing harmful yard build up but not doing any damage to the grass. The harmful thatch build up in your lawn could be caused by insects, moss or undesirable grasses growing in your lawn. 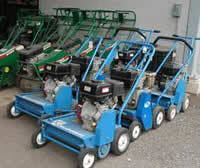 A dethatching machine can remove all these items while still leaving your lawn intact. Dethatching lawns helps the lawn by removing thatch that can compete in the lawn for air, water, and sunlight. Although the lawn may look a little worse after thatching, most lawns improve after 2 to 3 weeks. How is a Lawn Thatcher designed to work? A lawn dethatcher has 4 reels of vertical blades that spin on the under carriage. Thee are 20 to 30 blades on each real. The reels work the same way as a thatching rake and pull the moss and other thatch out of the lawn as they spin. There is no power assist on a thatcher but the spinning motion of the blades makes will pull the dethatcher along in most lawns. Thatching should not destroy the grass but it does thin it out a little. For a quicker recovery it may also be a good idea to reseed or fertilize after thatching.